In scenes tracked with AE's 3D camera tracker, the ground plane of your scene in most cases ends up as an oblique plane in 3D space. 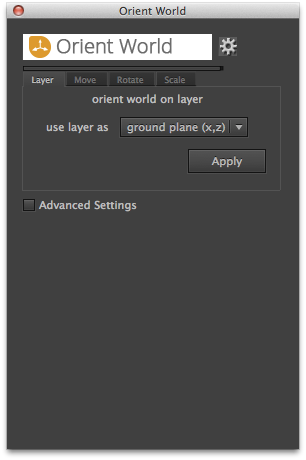 Orient World fixes this - with a single click you turn a layer into the ground plane of your scene and orient everything accordingly. Instead of setting a ground plane, you can also align your scene on walls. To tweak it even further, you can move, rotate and scale your coordinate system manually in 3D space. 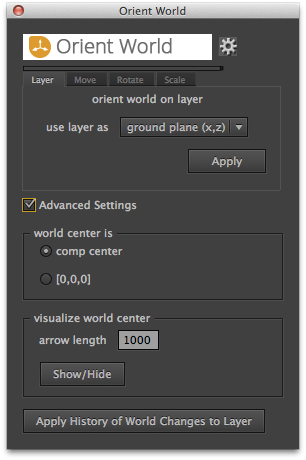 Furthermore, Orient World offers an intuitive visualization of the coordinate system such that you always know where the center of your world is located.